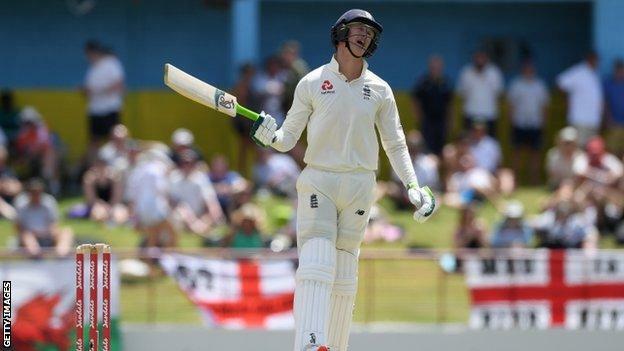 Ben Stokes and Jos Buttler put England in a promising position after more top-order troubles on day one of the third Test against West Indies. 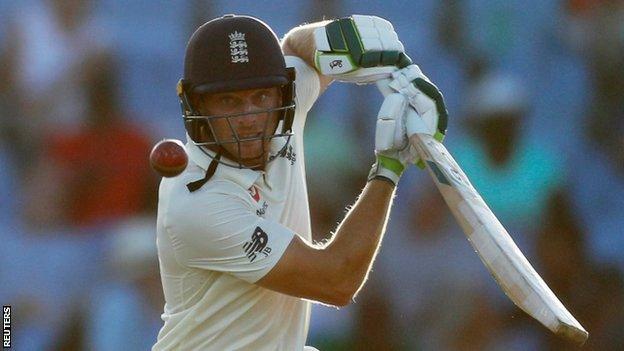 England fell to 69-3 but an unbeaten 62 from Stokes and 67 not out from Buttler saw them close on 231-4 in St Lucia. The pair put on 124 – England’s first century partnership of the series – as they dominated the evening session. Stokes was reprieved on 52 when he was caught and bowled by Alzarri Joseph but replays showed it was a no-ball. The England all-rounder had already left the field by the time the decision was confirmed and unusually he had to return from the dressing room to resume his innings – only permitted since a law change in 2017. 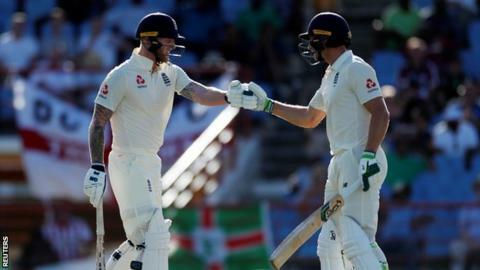 West Indies have already clinched the series, after crushing victories in the first two Tests, but England’s best batting display so far in the Caribbean gives them a chance of setting up a consolation win. England’s batsmen have been a major disappointment in this series with just one total of more than 200 in their four innings before this game. With the team’s new-look top three all dismissed with only 69 runs on the board, and captain Joe Root out for 15 on the stroke of tea leaving the score 107-4, there were fears of yet another low score. Buttler looked nervous at first, slashing at a full delivery and being dropped at second slip on nought, but grew into his innings. He batted maturely with few loose shots after his frantic start and then scored more of his trademark boundaries late in the day. Stokes, meanwhile, played with controlled aggression from the outset. He quickly overtook Buttler’s score and was first to reach his fifty – only England’s fourth of the series. Stokes seemed to time the ball better than any of his team-mates. He also batted at what looked a more natural pace than the conservative approach he has adopted in his 12 Tests since returning to the team after being arrested outside a Bristol nightclub. His one moment of fortune came in the evening session when he hit a pull shot straight back to the bowler Joseph, who took a smart reaction catch. Under previous laws Stokes would not have been able to return to the crease once he had left the field but, on this occasion, once the no-ball was called Stokes returned from the dressing room, collected his gloves and helmet from the boundary edge and resumed his innings to loud cheers from the England fans. But while Stokes and Buttler impressed, there was a familiarity to England’s struggles at the top of the order. Keaton Jennings, recalled to open the batting in a move that pushed Joe Denly down to number three, was dismissed again edging a full delivery to slip – this time off Keemo Paul for eight. He could have been out twice earlier – first through a not-out lbw decision that would have been overturned had West Indies reviewed, and then to a dropped catch at third slip, both in the space of three balls. Jennings’ opening partner Rory Burns batted patiently for 29 from 109 balls but was out lbw to Paul, who impressed in place of suspended West Indies captain Jason Holder, when he missed a straight delivery. That sparked a frantic period for England with Paul swinging the ball and Shannon Gabriel bowling express pace with hostility. The latter trapped Denly lbw for 20 in the over after Jennings’ dismissal. Root then did little to calm England nerves. He played a wild drive to a full, wide delivery that he was lucky not to edge behind for a duck, before putting on 38 with Buttler. It looked like the England captain had come through his difficult start but he got a fine edge through to the wicketkeeper when cutting a wide delivery off Joseph. Root has now gone seven innings without scoring a fifty, the joint-longest run without a half-century in his career, and if he fails to do so in the second innings it will be the first time he has not passed 50 in a series. Also of concern is the fact England are now three innings away from an Ashes series and will be unsure about any of their top three batting positions. Former England captain Alastair Cook on The Cricket Social: “England played well on an attritional day. “They said it was going to be the quickest wicket in the Caribbean but it didn’t quite seem like that. England’s Ben Stokes, speaking to Sky Sports: “We’ve been disappointed with the way we’ve played. This is still a challenging wicket so to come off four wickets down, we’re pleased with that.